Two of my favourite ingredients: Lemon and Butter. Results: Heavenly. 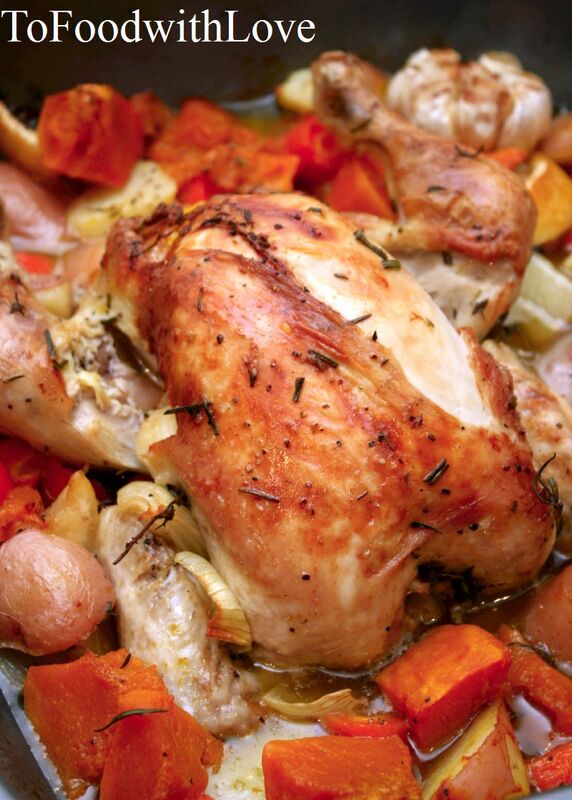 Everyone should know how to prepare a basic roast chicken. It's easy and you'll be amazed how such simple flavours come together wonderfully in this dish. You really can't go wrong with these basic ingredients. Use fresh herbs, and free-range or chemical free chickens are best as they yield perfectly tender, moist and juicy results. Butter adds depth to the pan juices, making the sauce delightfully rich and luscious. Cut the potatoes, carrots and pumpkin into chunks the size of golf balls. Parboil potatoes by placing them in a pot of salted water and bring to boil for 8-10 minutes. Drain in colander and leave to dry. Combine potatoes, carrots and onion with olive oil, salt, pepper and some of the rosemary. Do the same for the pumpkin in a separate bowl and put aside. Place everything except for the pumpkin into a large roasting pan. Rub the chicken all over with olive oil, rosemary, thyme and plenty of salt and pepper. Use a knife to stab the lemon all over and place the lemon in the cavity of the chicken, together with two sprigs of thyme and 3 cloves of garlic. Slide fingers under the chicken skin and insert some butter and garlic cloves under the skin. Place chicken (breast-side up) in the roasting pan on top of the vegetables and throw in a few sprigs of thyme, remaining garlic cloves and the rest of the butter all over the vegetables. Toss the whole head of garlic into the pan. Roast uncovered for about 30 minutes. Then, add in the pumpkin and roast for another 30 minutes or until chicken is cooked and the juices run clear. ﻿Remove from oven and let chicken rest for 10 minutes, covered with aluminium foil. Squeeze out the garlic from the roasted garlic bulb and serve with chicken along with the vegetables and pan juices. Note: If there are leftover pan juices, you can thicken it up with some cream to make a sauce for your favourite pasta. Yes! Comfort food for all seasons!